This is the only species of 'woody veronica' (Hebe) which is at all frequent as a self-sown shrub of such habitats as mortared walls and quarries. The species was introduced from New Zealand as a garden ornamental shrub. 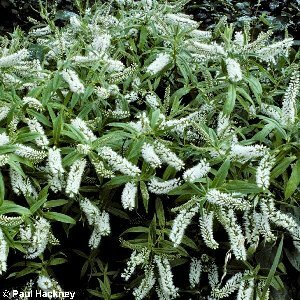 It has narrow spikes of white flowers and long, narrow, willow-like leaves. All names: Hebe salicifolia (G.Forster) Pennell; Veronica salicifolia Forst.f.